How to Cite This Chapter: Loeb M, Kuś J, Jankowski M. Community-Acquired Pneumonia. McMaster Textbook of Internal Medicine. Kraków: Medycyna Praktyczna. https://empendium.com/mcmtextbook/chapter/B31.II.3.11.1 Accessed April 23, 2019. Community-acquired pneumonia (CAP) is characterized by signs and symptoms of an acute lower respiratory tract infection and new-onset opacities observed on chest radiographs that cannot be explained otherwise (eg, by pulmonary edema or pulmonary infarct). For the purposes of this chapter, this definition does not apply to patients with cancer; immunocompromised individuals; persons hospitalized for pneumonia in oncology, hematology, palliative care, infectious diseases, or AIDS units; patients living in long-term care institutions; and patients hospitalized within the prior 14 days. Etiologic agents: CAP can be caused by a large number of microbial species but most frequently by Streptococcus pneumoniae, Haemophilus influenzae, and Mycoplasma pneumoniae. In a large number of patients, there may be dual infections, particularly where viruses (such as influenza) predispose to superinfection with bacteria such as S pneumoniae or Staphylococcus aureus. Pathogens may reach the lower respiratory tract as a result of microaspiration of upper respiratory tract secretions, aspiration of oral and upper respiratory tract secretions, inhalation of droplets produced by a coughing patient with viral infection, inhalation of a water aerosol containing Legionella organisms, or exposure to droplet nuclei, such as tuberculosis. Pneumonia may also be caused by fungi, viruses other than influenza or parainfluenza, or mycobacteria, which depend on epidemiologic exposure and host factors. 1. Symptoms typically have an acute onset and include fever, chills and sweating, pleuritic chest pain, cough with or without the production of purulent sputum, and dyspnea (in some patients). Elderly patients with CAP are more likely to have nonspecific symptoms, may not develop fever, and may develop confusion. 2. Signs: Tachypnea, tachycardia, dull percussion over the area of inflammatory infiltrate, crackles, increased tactile fremitus, and sometimes bronchial breath sounds. In patients with pleural effusion, dull percussion, absence of tactile fremitus, and poorly audible breath sounds are observed. 1) Signs and symptoms of acute lower respiratory tract infection: Cough and ≥1 additional manifestations of lower respiratory tract infection, such as dyspnea, pleuritic pain, or hemoptysis. 2) New local findings on examination of the chest. 3) One or more of the general signs and symptoms: Sweats, chills, myalgia, temperature ≥38 degrees Celsius. 4) No other explanations for the observed manifestations. To decide on an outpatient or inpatient treatment setting, use the CRB65 score (Figure 1) in outpatients and the CURB65 score (Figure 2) in hospitalized patients. Pulse oximetry can be considered in settings where emergency oxygen is used. 1) Chest radiography: Results reveal new infiltrates. There are no strong correlations between specific radiographic patterns and etiologic agents. 2) Complete blood count and differential blood count: Leukocytosis with predominant neutrophils may be suggestive of a bacterial etiology. 3) Serum levels of urea, electrolytes, bilirubin, aspartate aminotransferase, and alanine aminotransferase may be used to help determine the severity of the systemic disease. 4) Serum C-reactive protein (CRP) levels (levels <20 mg/L suggest against the diagnosis of bacterial pneumonia; the increase is more pronounced in pneumococcal pneumonia with concomitant bacteremia than in pneumonia caused by viruses or Mycoplasma spp) or procalcitonin levels (also may be helpful in making the decision to discontinue antibiotic treatment). 5) Measurement of blood oxygen levels: Pulse oximetry (hypoxemia may be observed). In patients at risk of hypercapnia, patients with hemoglobin oxygen saturation in arterial blood (SaO2) <92%, and patients with severe pneumonia, measure arterial blood gas levels. 6) Microbiology: Collect 2 sets of blood cultures and sputum specimens for culture in patients with moderate or severe CAP prior to starting antimicrobial therapy, if possible. In those with severe CAP, also collect urine to test for S pneumoniae antigen and Legionella antigen (serogroup 1 only; also in cases of suspected legionellosis). 1) Serologic studies may be performed in patients with severe CAP and where other diagnostic tests have failed to provide an etiology. This is particularly important for patients who have failed to improve or in the setting of an outbreak. Infection is usually indicated by a 4-fold increase in serum IgG levels at an approximately 3-week interval. 2) Bronchoscopy may be performed to collect samples for testing and is used as part of differential diagnosis (in patients with suspected bronchial obstruction/stenosis, lung cancer, aspiration, or patients with recurrent pneumonia) as well as to evacuate respiratory secretions from the airway. 3) Thoracentesis as well as biochemical, cytologic, and microbiological examination of pleural effusion are performed when indicated (in patients with parapneumonic effusion). Differential diagnosis includes lung cancer, tuberculosis, pulmonary embolism, eosinophilic pneumonia, acute interstitial pneumonia, cryptogenic organizing pneumonia, lung involvement in collagen tissue diseases, and systemic vasculitis. Lack of efficacy of the initial empiric treatment is an indication for an intense diagnostic workup in search for the etiologic factor and for a repeated differential diagnosis. 1. Outpatient treatment: Smoking cessation, rest, drinking large quantities of fluids. Use acetaminophen (INN paracetamol) to control fever and pleuritic pain when present. Pulse oximetry may be useful for assessment of severity and oxygen requirement. 1) Oxygen therapy with SaO2 monitoring (in patients with chronic obstructive pulmonary disease [COPD], consider repeated arterial or venous blood gas measurements) with a target partial pressure of oxygen in arterial blood (PaO2) ≥60 mm Hg and SaO2 94% to 98% (88%-92% in patients with COPD and patients at risk of hypercapnia). If hypoxemia persists in spite of high-concentration oxygen therapy, consider high-flow oxygen therapy or mechanical ventilation. 2) Assess volume status and nutrition. Administer fluids and start nutrition therapy when indicated. 3) We suggest oral prednisone (50 mg once daily for 1 week), particularly in patients with CRP >150 mg/L, patients requiring mechanical ventilation, or patients with septic shock.Evidence 1Weak recommendation (benefits likely outweigh downsides, but the balance is close or uncertain; an alternative course of action may be better for some patients). Moderate Quality of Evidence (moderate confidence that we know true effects of the intervention). Quality of Evidence lowered due to imprecision. Siemieniuk RA, Meade MO, Alonso-Coello P, et al. Corticosteroid Therapy for Patients Hospitalized With Community-Acquired Pneumonia: A Systematic Review and Meta-analysis. Ann Intern Med. 2015 Oct 6;163(7):519-28. doi: 10.7326/M15-0715. Review. PubMed PMID: 26258555. 1. In patients who are referred to hospital with suspected CAP, consider starting antimicrobial treatment immediately in the case of severe illness or a risk of delay in reaching the hospital (>2 hours). In hospitalized patients, start antibiotic treatment as soon as possible after the diagnosis is established. 2. Choice of antimicrobial agent(s): Initial empiric treatment: Table 1; if the etiologic agent is known: Table 2. In hospitalized patients, switch from intravenous to oral antibiotic when the patients are hemodynamically stable, improving clinically, and able to ingest medications. 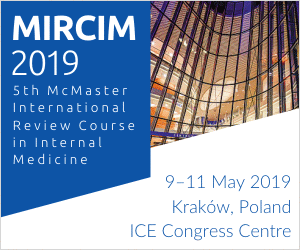 It should be noted that European recommendations differ from current North American guidelines, as amoxicillin is the first-line therapy for mild CAP while ampicillin or penicillin IV and a macrolide is recommended for hospitalized cases, while amoxicillin and clavulanic acid and a macrolide are recommended for severe hospitalized cases. 3. Duration of treatment: In outpatients and the majority of hospitalized patients, treatment is continued for a minimum of 5 days. The patient should be afebrile for 48 to 72 hours prior to discontinuing antibiotics. Key considerations are normalization of vital signs and oxygen saturation, return to normal mental status, and ability to maintain oral intake. Longer treatment should be considered if the expected improvement in symptoms does not occur during the first 3 days; in patients with severe CAP of undetermined etiology, it is continued for 10 days; and in patients with CAP caused by Legionella pneumophila, staphylococci, Pseudomonas aeruginosa, Acinetobacter baumannii, or gram-negative intestinal bacilli, for 14 to 21 days. 1. Outpatients: Perform a follow-up examination after at most 48 hours. If no clinical improvement is observed, consider referring the patient for chest radiography and other diagnostic studies. 1) Monitor temperature, respiratory rate, pulse, blood pressure, mental status, and SaO2. Initially perform these assessments at least twice a day, or more often in patients with severe pneumonia. In patients who receive an appropriate antibiotic, improvement should be observed within 24 to 48 hours. 2) In patients with clinical improvement, do not repeat chest radiographs prior to discharge. If the improvement has not been satisfactory, repeat chest radiographs. 3) If the initial empiric treatment has not been effective, make intensive efforts to identify the antibiotic-resistant pathogen(s) and repeat differential diagnosis. 4) Do not discharge patients who fulfill ≥2 of the following criteria during the prior 24 hours: temperature >37.5 degrees Celsius, respiratory rates ≥24/min, heart rates >100/min, systolic blood pressure ≤90 mm Hg, SaO2 <90% (while on air), abnormal mental status, inability to eat without assistance. Consider a delayed discharge in those with a temperature >37.5 degrees Celsius. 5) In every patient, schedule a follow-up visit within ~6 weeks. Chest radiographs should be repeated in all patients with persisting signs and symptoms and patients at a higher risk of developing cancer (particularly tobacco smokers and patients >50 years). Radiographic abnormalities, especially when extensive, resolve less rapidly than clinical features (typically within 4-8 weeks), particularly in elderly patients. If radiologic or clinical abnormalities persist after 6 weeks or recur in the same location, perform bronchoscopy. 1. Pleural effusion and empyema (see Exudative Pleural Effusion). 2. Lung abscess: A purulent collection located in the pulmonary parenchyma that most frequently develops as a consequence of pneumonia caused by staphylococci, anaerobic bacteria, Klebsiella pneumoniae, or P aeruginosa. Signs and symptoms are the same as in pneumonia. Diagnosis is based on radiologic findings revealing an interstitial cavity with an air-fluid level. Treatment: Antimicrobial agents and postural drainage. In rare cases not responding to treatment, surgical resection is used. As an initial empiric treatment, penicillin G (INN benzylpenicillin) 1.8 to 2.7 g (3-4.5 million U) IV qid in combination with metronidazole 0.5 g IV qid can be used; clindamycin 600 mg IV qid; or amoxicillin + clavulanic acid 1.2 g IV tid to qid. If the etiologic agent and its resistance pattern are known, start targeted treatment. Treatment should be continued until the abscess cavity closes (usually within a few weeks). Diagnosis: This group of patients is particularly vulnerable to infections with mycobacteria, fungi (Aspergillus fumigatus, Candida albicans, Pneumocystis jiroveci), and viruses. The etiologic organism will differ depending on both host characteristics (specific immunologic defect) and epidemiologic exposures. Generally, diagnostic evaluations may include microscopic evaluation of sputum (this may help with the diagnosis of pneumocystosis and tuberculosis), sputum cultures, blood cultures, bronchoscopy and bronchoalveolar lavage, computed tomography (CT) scan imaging (eg, aspergillosis), or alternatively transbronchial lung biopsy specimens. Surgical lung biopsy may also be needed for some cases. Treatment: Start treatment empirically, that is, prior to confirming the microbiologic etiology, based on the nature of the immunocompromised state and knowledge of exposures. Prompt infectious diseases consultation is warranted. If CA-MRSA is a consideration, add vancomycin or linezolid. Source: Mandell LA, Wunderink RG, Anzueto A, et al; Infectious Diseases Society of America; American Thoracic Society. 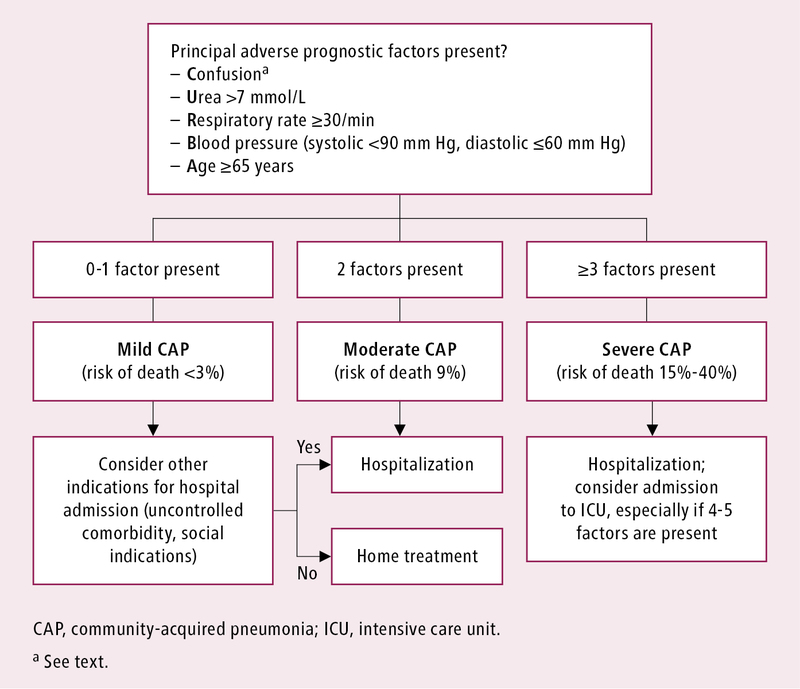 Infectious Diseases Society of America/American Thoracic Society consensus guidelines on the management of community-acquired pneumonia in adults. Clin Infect Dis. 2007 Mar 1;44 Suppl 2:S27-72. CA-MRSA, community-acquired methicillin-resistant Staphylococcus aureus; ICU, intensive care unit; MIC, minimum inhibitory concentration. Choices should be modified on the basis of susceptibility test results and advice from local specialists. Refer to local references for appropriate doses. a Levofloxacin, moxifloxacin, gemifloxacin (not a first-line choice for penicillin susceptible strains); ciprofloxacin is appropriate for Legionella and most gram-negative bacilli (including Haemophilus influenzae). b Azithromycin is more active in vitro than clarithromycin for H influenzae. d Piperacillin-tazobactam for gram-negative bacilli, ticarcillin/clavulanate, ampicillin/sulbactam or amoxicillin/clavulanate. e Ticarcillin, piperacillin, ceftazidime, cefepime, aztreonam, imipenem, meropenem. INN, International Nonproprietary Name; MIC, minimum inhibitory concentration. Figure 1. Severity assessment of community-acquired pneumonia in the outpatient setting: CRB-65 score. Adapted from the 2009 British Thoracic Society guidelines (see Additional Information for details). Figure 2. 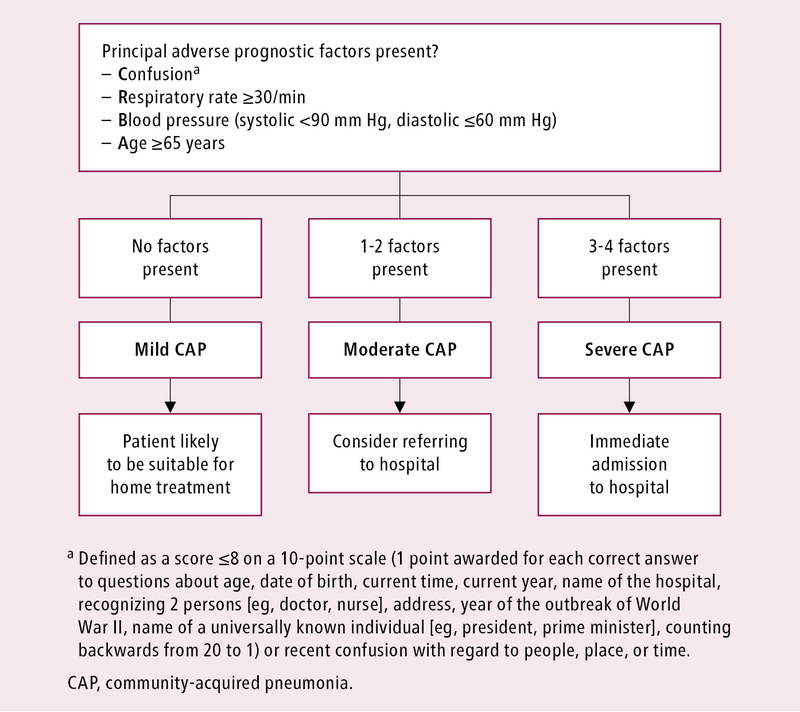 Severity assessment of community-acquired pneumonia in the inpatient setting: CURB-65 score. Adapted from the 2009 British Thoracic Society guidelines (see Additional Information for details).